Well, we are already on the home stretch in 2018 and trying to see how this year will stack-up in home sales data. This has been an unprecedented decade of artificial stimulus for the housing market and we will soon find out how the hangover feels. Our charts today will examine prices, sales volume, inventory and foreclosure activity. 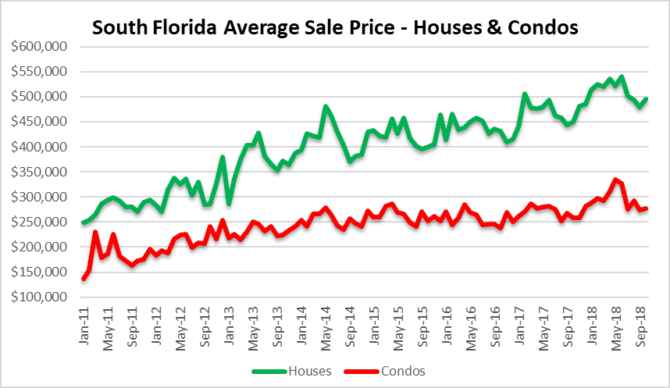 By looking at our chart, you will notice that the residential prices in South Florida peaked in June. Since then, the sale price of house have declined 8% and condo prices declined 16%. During October, the average single-family home sold for $495,133 and the average condo sold for $276,331. When we compare residential sales volume from October to June, house sales are down 20% and condo sales dropped 14%. There were a total of 7,614 deals closed in Miami, Fort Lauderdale and Palm Beach in October. 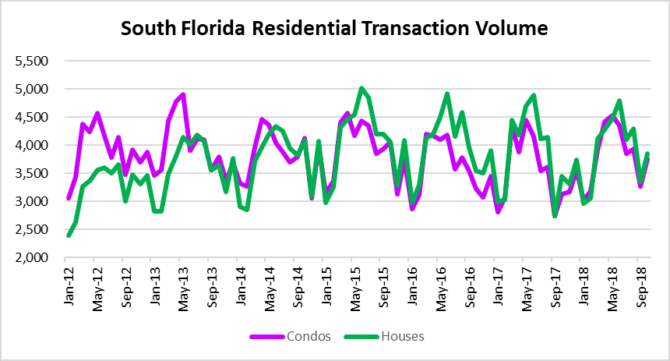 Although this is typically a slower time of year for South Florida real estate deal volume, this may finally be indicating a more significant slowdown. A slowdown in sales volume usually leads to a gradual increase in available inventory. 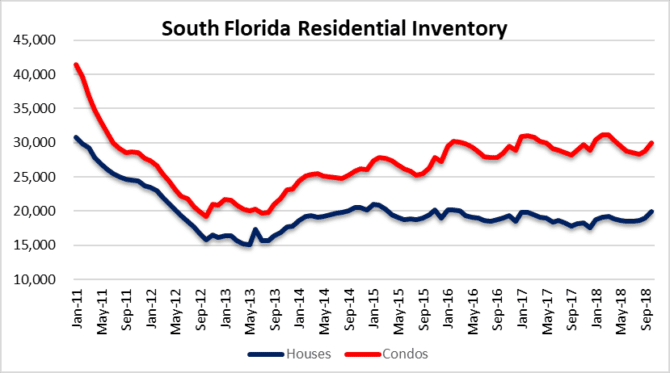 In October there were 19,871 houses and 29,972 condos for a total of 49,843 properties available for sale in South Florida. If you look at the far left of our inventory chart, you will see that residential inventory was over 72,000 properties listed for sale back in January 2011 in the post-crisis market. After that, foreclosures were halted, housing bailouts commenced and inventory declined rapidly. The trend of available properties does appear to be climbing again. If transaction volume remains sluggish, we will see inventory climb. That will keep prices in check. 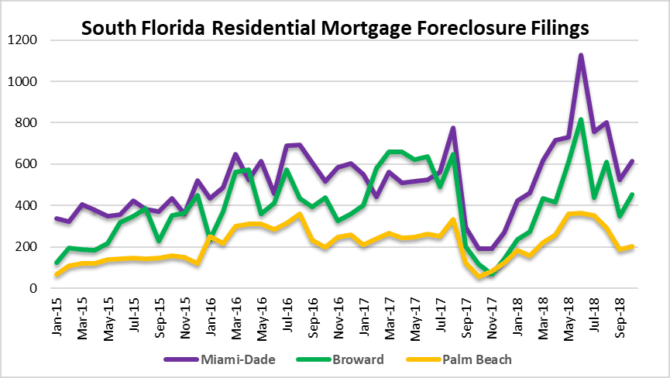 Nearly a decade after the housing crisis, we still have plenty of foreclosures in Miami, Fort Lauderdale and Palm Beach. There was a big spike in new filings during the month of June, but it appears to have slowed through October. This entry was posted in Fort Lauderdale real estate, Market Insight, Miami real estate, Palm Beach real estate, South Florida Real Estate and tagged Fort Lauderdale real estate, Miami real estate, Palm Beach real estate. Bookmark the permalink. Both comments and trackbacks are currently closed.